Block & Tackle is John Teti’s column about pro football. Monday Night Football commentator Mike Tirico closed his broadcast of the New England Patriots’ 20-13 victory over the Buffalo Bills this week by complaining about the referees. “What a screwed-up night of plays and officiating this was. Wow. Again, on a Monday,” he muttered. Apparently Tirico took special offense that so many recent foulups have happened on his watch, preferring that the referees would save their garbage calls for, say, Jim Nantz and his rinky-dink Thursday night operation over at NFL Network. Monday night’s erroneous tweet was compounded by confusion over the timing of the whistle and a rare sideline-interference penalty against Bills coach Rex Ryan. (That foul was justified, as Ryan’s obstruction of line judge Gary Arthur—who lost sight of the play and blew the whistle—set the whole mess into motion.) And Steratore’s hodgepodge of rulings emerged only after discussions among his colleagues that were reminiscent of the Yalta Conference, except longer and with somewhat less Stalin. Still, stray whistles happen, and ESPN’s Sport Science argued that the officials’ cavalcade of screwups ended up giving New England the same approximate field position that the team would have achieved anyway. The more substantial (if less spectacular) injustice occurred on the game’s final play, when Buffalo receiver Sammy Watkins caught a pass and fell backward onto the sideline with two seconds remaining. Even though Watkins got out of bounds, head linesman Ed Walker swung his arm to signal that the clock should keep running. The game ended, denying Buffalo a last-gasp play from midfield to potentially tie the score. Afterward, Steratore told the press that the clock continued to run because Watkins was judged to have “given himself up” on the field of play—he supposedly hit the ground to declare himself down, in essence, before reaching the boundary. This reasoning was so ridiculous that it was deemed “not plausible” by CBS rules analyst Mike Carey, who knows an implausible explanation of an NFL play when he hears and/or provides one. These bizarre mishaps come in the wake of an uncalled illegal-bat penalty that doomed the Lions in Week 4 and an inexplicable theft of 18 seconds from the Steelers the following week. Tirico’s Garfield-esque plaint, “Again, on a Monday,” implies a belief that the Monday Night Football tradition is being sullied by these errors. But in a way, the clumsy officiating complements the modern-day MNF, which is the shaggiest pro football broadcast on national TV. No mortal may interfere with ESPN’s Favre worship! So it has been decreed by the almighty “ESPNMNF” shiny triangle thing, so it shall be done. The audio from the booth is a different story, as demonstrated by the tail end of that clip, in which Tirico and his color analyst Jon Gruden struggle to have a coherent conversation the same way that you or I might struggle to prove the Riemann hypothesis. Tirico’s difficult relationship with the English language has been noted in this space before, but Gruden is worse. Oddly enough for a network that (in theory) prides itself on innovative coverage, Gruden’s shtick feels dated, plagued with hacky announcing tics that most of his colleagues in the industry have tried to abandon. Noting that Amendola is filling in for the injured Julian Edelman, which had been previously established. Observing that Amendola’s catch was a nice catch. Gruden also abuses hyperbole more than any single human being ever in the entire history of the whole universe. As he does with his expressions of player admiration, Gruden employs exaggeration as an analysis-like substance. “Look out there at Alan Branch, #97,” Gruden said after Branch helped stuff a Bills run Monday night. “You’ll be hard-pressed to find a bigger man on this planet, Mike.” Sharing the field with Branch was Buffalo offensive tackle Cordy Glenn, who weighs 345 pounds to Branch’s 350. Granted, that does not quite disprove Gruden’s hypothesis, but given that I could find someone on screen who’s just a few sandwiches shy of Branch’s heft, I would suggest that Gruden could have offered more valuable insight here. The grumpy, bland Tirico is not much more enjoyable on the whole, but Gruden’s broadcast partner has one thing going for him: He knows the rules as well as anyone in the business. He caught the officials’ final-play snafu seconds after it happened, and at other times in the game, he demonstrated his grasp of more esoteric officiating concepts. 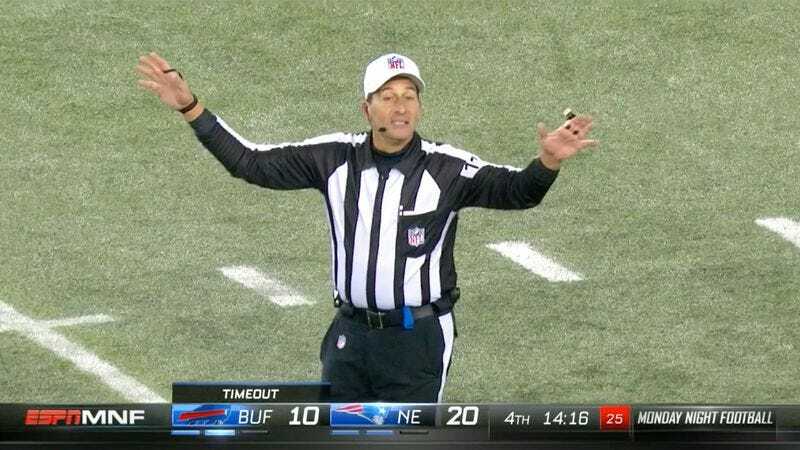 During the Bills’ last drive, officials waited 20 seconds before calling timeout for a replay review on a close play. Gruden complained that “a lot of time ran off,” implying that the refs had bumbled by failing to stop the clock earlier. In fact, Steratore observed proper protocol by waiting until the next snap was imminent before announcing the review. The idea is to minimize the impact of replay on the flow of the game: If Steratore blew the whistle as soon as he received the signal for a review, it would essentially grant the Bills a free timeout. By waiting until the moment when Buffalo was about to run a play, Steratore avoided giving the Bills much of a meaningful advantage. What’s remarkable is that Tirico knew this and immediately corrected Gruden. I can’t think of another play-by-play announcer who would have the knowledge and wherewithal to make this superb call. So it’s cruelly fitting that Tirico’s Monday Night Football has been the scene of this season’s most extraordinary officiating mishaps. When football’s rules are mangled and misapplied, Mike Tirico is the person you want on the scene. It would be nice for NFL officiating crews to clean up their act, but in the meantime, maybe you’ll forgive me for secretly hoping they screw up again, on a Monday. That’s all for this week, friends—time to go eat Thanksgiving. Here are Block & Tackle’s predictions for the Week 12 slate. All Block & Tackle predictions are guaranteed to be correct. If there is a discrepancy between a prediction and an actual football game, the football game is wrong. Philadelphia Eagles vs. Detroit Lions (Thursday, 12:30 p.m., Fox): Philadelphia 24, Detroit 21. Carolina Panthers vs. Dallas Cowboys (Thursday, 4:30 p.m., CBS): Carolina 31, Dallas 28. Chicago Bears vs. Green Bay Packers (Thursday, 8:30 p.m., NBC): Green Bay 35, Chicago 20. Miami Dolphins vs. New York Jets (Sunday, 1 p.m., CBS): New York 17, Miami 9. San Diego Chargers vs. Jacksonville Jaguars (Sunday, 1 p.m., CBS): Jacksonville 21, San Diego 13. Buffalo Bills vs. Kansas City Chiefs (Sunday, 1 p.m., CBS): Kansas City 27, Buffalo 18. Oakland Raiders vs. Tennessee Titans (Sunday, 1 p.m., CBS): Tennessee 21, Oakland 15. Tampa Bay Buccaneers vs. Indianapolis Colts (Sunday, 1 p.m., Fox): Indianapolis 22, Tampa Bay 21. New Orleans Saints vs. Houston Texans (Sunday, 1 p.m., Fox): Houston 18, New Orleans 14. Minnesota Vikings vs. Atlanta Falcons (Sunday, 1 p.m., Fox): Minnesota 23, Atlanta 19. New York Giants vs. Washington (Sunday, 1 p.m., Fox): Washington 31, New York 28. St. Louis Rams vs. Cincinnati Bengals (Sunday, 1 p.m., Fox): Cincinnati 27, St. Louis 14. Arizona Cardinals vs. San Francisco 49ers (Sunday, 4:05 p.m., Fox): Arizona 35, San Francisco 20. Pittsburgh Steelers vs. Seattle Seahawks (Sunday, 4:25 p.m., CBS): Seattle 21, Pittsburgh 16. New England Patriots vs. Denver Broncos (Sunday, 8:30 p.m., NBC): New England 20, Denver 18. Baltimore Ravens vs. Cleveland Browns (Monday, 8:30 p.m., ESPN): Baltimore 2, Cleveland 0.